I'm switching to a new benefits provider, Sequoia One, so I need to fill out my W-4 and DE 4 again. At my previous provider, I filed as Single, whereas I'd actually like to file as Head of Household for the year. In order to prevent overwithholding, I'd like to use Worksheet C, where you calculate the amount to be withheld monthly, rather than specifying a number of allowances. 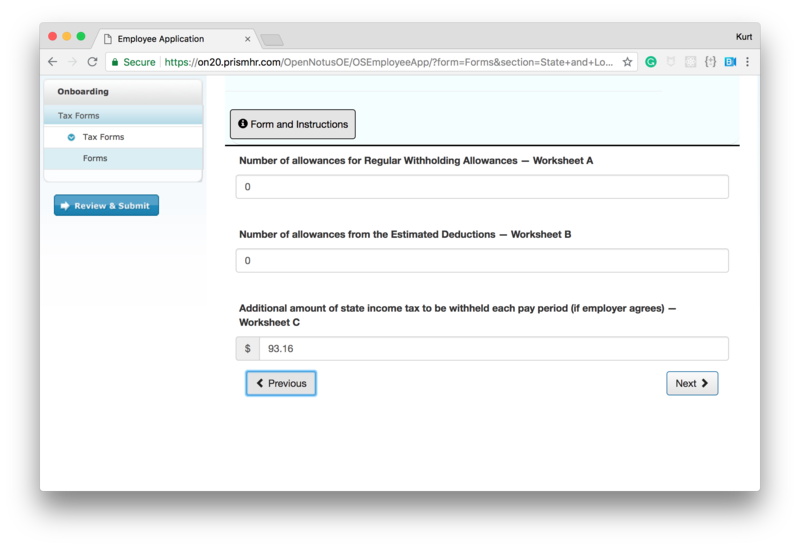 The form clearly states that you should fill out one OR the other, whereas the web form only allows you to fill out both. Is the DE 4 form thus generated not ambiguous? I want to prevent getting too much withholding or the California government 'misinterpreting' the form. Browse other questions tagged income-tax california withholding or ask your own question. When should I update my W-4 and when should I say I am married? What should I include on line 7 of US form 1040? Mortgage loan implications when tearing down existing house and building new one? What information from my 2018 and 2017 tax returns should I reference to complete my 2019 form W-4?